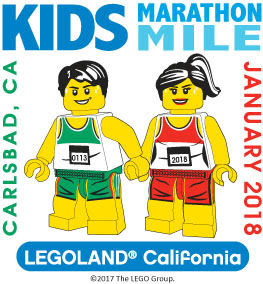 The morning before the big Carlsbad race, Saturday, January 13th, bring your children, nieces, nephews, grandchildren, neighborhood kids (you get the gist) to experience the joy of running at the Kids Marathon at LEGOLAND. Before LEGOLAND opens its doors to the public, they’re opening for us to enjoy the sights and sounds of LEGOLAND®! Participants can run, walk, skip, stroll, or even be pushed in a stroller or carried on this 1-mile fun run for kids of all ages and abilities.